International Journal of Research in Health Sciences,2015,3,1,174-178. 1–D.N.B (Obstetrics & Gynaecology), Assistant Professor; 2–MD (Radio diagnosis), Associate Professor; 3–MD (Radio diagnosis), Senior Resident. Shri Ram Murti Smarak Institute of Medical Sciences, Bareilly, Uttar Pradesh, INDIA. Background: Cervical cancer is a major health disorder among female population especially in developing countries like India. Cancer of cervix has also been recognized as a preventable disease by World Health Organisation (WHO). High incidence of cervical cancer is usually seen in certain strata of population, which makes it imperative to know the epidemiological status of the disease. Objective: To correlate the effect of age, parity, age of marriage, religion, socioeconomic status in the incidence of cervical cancer and its premalignant conditions. 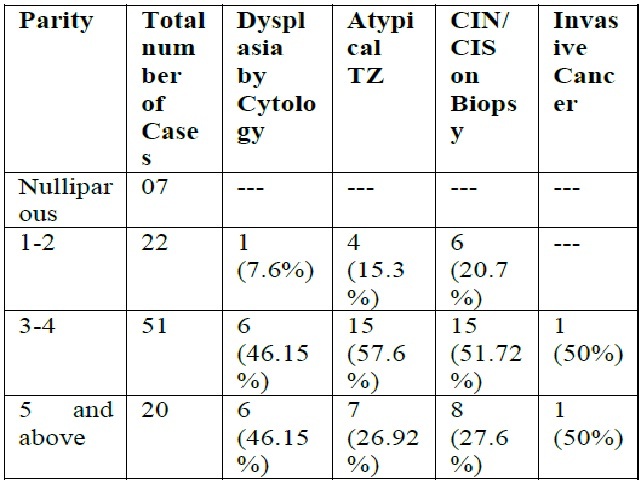 Materials and Methods: 100 sexually active patients of age group 10-50 years and above with complaints of unhealthy cervix were evaluated and their demographic data analyzed. Diagnosis of cervical cancer was established using colposcopically guided biopsy in the suspected cases. Results: Out of 100 women examined 77 were in the age group of 20-39 years comprising of 51 Hindus and 25 muslims. 37 patients from the group of unskilled workers and 28 from semi-skilled workers were seen. Most females had 3-4 para with only 7 females being nulliparous. 52, 30 and 8 cases of bilateral tubectomy, non-use of contraception and intrauterine contraceptive device (IUCD) respectively were seen. Conclusion: Factors like high parity, increased duration of married life (especially with regards to early teenage marriage), non- barrier contraceptive use and low socio-economic status are related to increased incidence of cervical cancer.